would love that as well. Any type of wrapper would be amazing for performance and backup speed ==> no need for ProRes RAW if cDNG gets a wrapper. Hi Kristian, on the topic of timecode, can multiple BMPCC4K camera be set to the real world time using the iOS app? The idea is a poor man's timecode sync. Also how many BMPCC4K can be linked to and triggered from 1 iPad app to start stop recording? Hi, will the BMPCC4K have a notch in the battery cover to allow for Canon dummy battery solutions? Unfortunately no. There is no such feature yet in the iPad control. The iPad app can only control 1 camera at a time. Cheong Ying Sien wrote: Hi, will the BMPCC4K have a notch in the battery cover to allow for Canon dummy battery solutions? No notch but the door is removable. So can can the time on the camera be set to the time on the iPad? Meaning the time universal iOS timer is synced to the bmpcc4k? Hi Kristian, to clarify: after the door is removed, will the battery or dummy catch and stay in place? Yes, it will stay in place. Why can't it be programmed for alternative uses of the ports, bluetooth and WiFi. It's easy enough to sandbox the use of the ports and part of the FPGA. Allowing people to program useful customisations. You know how Red developed the revolutionary Red ray codec, and told us they would reveal his it worked, but then didn't. Let's say somebody had a codec as good or better than redray and prores, which they want to put on your camera as an alternative to prores. That instantly can make the camera much more sable for TV, as you her a near lossless 50 mbit/s or less codec, a small fraction of the data rate of raw. rick.lang wrote: Oops, gotta make this post relevant to the thread. I guess I’m suggesting kinda silly but memorable names have a place in BMD’s marketing of cameras. Pocket? Hardly inspirational but better than BMPCC. Anyone know if the BMPCC4K can be powered by a V-lock battery? Apexring wrote: Anyone know if the BMPCC4K can be powered by a V-lock battery? Yes, using the external power plug on the camera side, 12-16vdc input. That said, you will need a bracket of some kind to hold the battery, and a DTap to Lemo (or what ever BM winds up using) cable to connect the camera. If you scroll down a bit there's an answer from this expert concerning the filter stack. The IR filter is 1.4mm. Does this mean it will need a special Speedbooster? But I think all BMD sensors have used a 2.4 mm sensor glass. Could 1.4mm be a typo? The question is relevant to the BMPCC4K if the sensor package comes from Sony. I don't think it's a typo, the comment states the other cameras have a 2.4mm filter. Thanks Sean. 1.4mm means wait for Metabones to do a specific SpeedBooster. rick.lang wrote: Thanks Sean. 1.4mm means wait for Metabones to do a specific SpeedBooster. 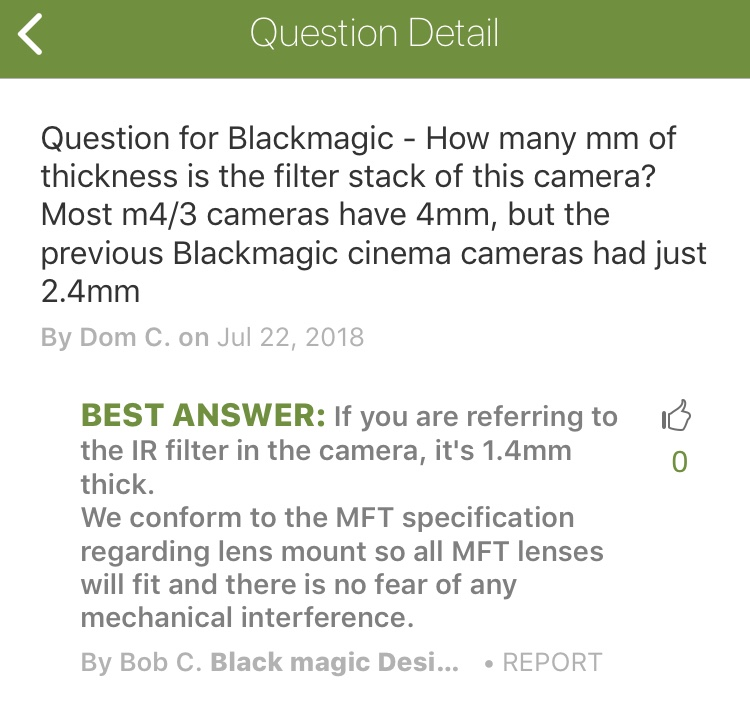 Did this question get deleted from the B&H page? I can't find it anymore. Sean van Berlo wrote: Did this question get deleted from the B&H page? I can't find it anymore. Sean, it’s still there. Just checked. I think the fear is that the Speedboosters will not work properly, didn't the existing speedboosters have pretty weird abberations on Blackmagic cameras because of the 2.4mm filter stacks? Dumb question, but if an IR filter is too thin, is it a simple change to manufacture a thicker one? Savannah Miller wrote: Dumb question, but if an IR filter is too thin, is it a simple change to manufacture a thicker one? You're essentially changing your optical stack so the flange focal distance is now out of whack and will have to be compensated, then the question becomes if there is enough space to do so. Please, BMD, just give us a better build quality IR filter for this camera then the ones from old Pocket. I have already changed mine twice due to glass corrosion (grease like stains) in our tropical wether. Brian Caldwell has previously posted that the SpeedBooster designs take into account the sensor glass. Designs like the Ultra assume 4mm glass. The BMD specific SpeedBoosters were designed for 2.4mm sensor glass. 1.4mm glass is even thinner and for best results wide open, the camera will need a new design of the SpeedBooster. This must be frustratingly thise who already have a prior BMD SpeedBooster since they’re not inexpensive. I’m not saying any old SpeedBooster will not work, especially if stopped down. I’m saying it makes even more sense given the thinner glass that Caldwell will design a SpeedBooster for BMPCC4K because this camera will represent a large market of discerning shootists. Copy on the Ultra. Do you think the XLs will work? Edit—Disregard. I just read your edit. rick.lang wrote: Brian Caldwell has previously posted that the SpeedBooster designs take into account the sensor glass. Designs like the Ultra assume 4mm glass. The BMD specific SpeedBoosters were designed for 2.4mm sensor glass. 1.4mm glass is even thinner and for best results wide open, the camera will need a new design of the SpeedBooster. This must be frustratingly thise who already have a prior BMD SpeedBooster since they’re not inexpensive. Any previous BMD specific Speedboosters will not work anyway without vignetting as the sensor size of the Pocket Cinema Camera 4K is larger than the Pocket Cinema Camera and Blackmagic Cinema Camera. Furthermore, the IR filter has never changed in thickness since the first camera. So are we talking about the sensor glass (as in the protective window) over the sensor, or are we talking about the thickness of the IR filter, which is another optical piece behind the lens mount? Or are we talking about the combined stack? Brian has always referred to the 2.4mm and 4mm glass over the sensor. I’ve never seen him comment on URSA Mini Pro that has the built-in ND filters for example. You are correct about the small exit pupil on the BMD SpeedBooster for the BMPCC for example. That’s not an issue with the Ultra as I understand it. But I’m saying I bet the 1.4mm sensor glass is possibly a concern and I’d wait to hear from Brian Caldwell before purchasing a SpeedBooster Ultra (or especially the XL) to mount on the BMPCC4K. rick.lang wrote: Brian has always referred to the 2.4mm and 4mm glass over the sensor. I’ve never seen him comment on URSA Mini Pro that has the built-in ND filters for example. You are correct about the small exit pupil on the BMD SpeedBooster for the BMPCC for example. That’s not an issue with the Ultra as I understand it. But I’m saying I bet the 1.4mm sensor glass is possibly a concern and I’d wait to hear from Brian Caldwell before purchasing a SpeedBooster Ultra (or especially the XL) to mount on the BMPCC4K. Seems like conjecture at this point because the only data point provided was the 1.4mm IR glass filter thickness which has been consistent across all the cameras. The actual thickness of the sensor cover glass has not been disclosed, nor have anyone from Speedbooster contacted us to request any information. It'd be quite disappointing if the viltrox speedbooster isn't compatible. You can put together such an affordable camera. 180 AUD vs 800 AUD is just too big a difference to justify. Ryan Payne wrote: It'd be quite disappointing if the viltrox speedbooster isn't compatible. You can put together such an affordable camera. 180 AUD vs 800 AUD is just too big a difference to justify. They have been in touch and are sending us a unit to test. Thanks, Kristian. Perhaps I’m wrong about the 2.4mm thickness. That figure has been in my head for years but it’s possible it’s 1.4mm. I really don’t understand why the sensor glass thickness wouldn’t be disclosed. It sounds like Canon never once commenting that their EF mount FFD is 44.0mm. To what point is this lack of transparency? Interesting that Brian has never contacted you about these things in the past or with regard to the BMPCC4K yet he’s made some devices that are both very popular and very important to the usefulness of your cameras with a mFT mount. Last edited by rick.lang on Sun Aug 12, 2018 1:18 pm, edited 1 time in total. First off, The Pocket and BMCC Speed Boosters came out aftermthr Cameras were released, so they had the camera. Next the IR Filtermis not the total sensor/cover glass stack, which is set for thr MFT FFD standard to allow MFT lenses to focus correctly. A Speed Booster needs to be set for this thickness. Since the existing MFT Ultra and XL are working with the prototype csmeras, it might be safe,to,assume, thr new Pocket 4K complies to the existing standard used in the GH5S. Anything else about this is pure speculation, and we need to wait until the camera has been released into the “wild”. Optically any metabones be it the normal/ultra/XL versions that have worked previously on the gh4/gh5/EM-1 should work on the pocket 4K since the sensor and crop is the same as the gh5? Where as the bmcc and bmpcc had specific metabones for their x2.2 and x2.88 super 16 crop right? Good points Apexring and Denny. If the sensor glass follows the mFT standards and it might well do that if everyone that Sony has sold the sensor assembly to is just using the identical assembly in terms of the thickness and material of the glass. BMD could end the discussion with a stroke of the pen. But my concern develops from the earlier post that it is possible that BMD has designed changes from the norm as part of their secret sauce. If BMD’s design does not result in any difference to the behavior or path of light traveling through the Colour Filter Array or sensor cover, then I have no concern at all. I was merely stating a possibility but it seems to be turning too argumentative (in the absence of clarification from BMD) which is not my intent as most of you know. Kristian’s last posts are very encouraging. You’ve been in these forums for as long as I can remember; always with diplomatic and objective inputs. We appreciate that. Question, I have a LUT that I love and is ‘tuned’ for Canon C-Log. Is there a way to ‘mathematically’ create a matching LUT for BMD Film? Or is that even a thing (e.g. LUT Calc)? I spoke with the folks over at Abel Cine and they can match it as a service for a fee. I suspect they do it optically. For instance, if C-Log + LUT 1 = Look A; I need BMD Film + LUT 2 = Look A. Does that make sense? I need to create a LUT 2. Apexring, the new Pocket 4K sensor is the same size as the GH5S, bothmof ehich are a little larger than the GH4/5 sensor, which is a little smaller than the full gate MFT sensor found on the AF100, and GH2/3 so the crop factor between the GH5S and Pocket 4K will be closer to 1.8 in full gate DSC4K 17:9 and around 2X in 16:9 (horizontal measurement). Andres, thanks so much for the very thoughtful words. I am sorry though that my experience with creating LUTs is nil. I’m going to look into LUTs shortly as I may need to use a LUT on the video I shot Friday. I’m hoping though that someone with greater experience can answer your question now. I know what you mean, but it might mean you may end up creating your own LUT to approximate the Look A you want when using the BMD camera. Until this weekend I haven’t felt I’d need to use a LUT but I hope to give it a go in the next few days. So if I understand correctly, sensor stack is the optical glass + the IR filter? And since the IR filter is 1.4mm, there is an extra bit of thickness within the glass too that needs to be accounted for? Sensor stack normally refers to the sensor, cover glass and any filters in front of and stacked on top of the sensor, think a sandwich. Maybe I am blind and have overlooked the answer. But has the BMPCC4k got a proper IR filter like the UMP or do we need to put extra IR filtration onto the lenses like with the BMCC? Robert, BM states it has an IR filter, now if it is a effective as thr IR filter on the Ursa Mini Pro/Broadcast, the jury is out on this, as no camera to test with. All of the unkowns are kind of like discerning Mars with the Hubble and remote sensors. All will be known once we land in a few weeks. Not sure if it's been asked/ requested but will we be able to dual record/ relay record? SSD - Cfast for higher codecs and SSD- SD or Cfast to SD for lower? Would really be a fantastic feature to bump this into a cheap yet professional workhorse of a small form factor camera. It's a real big asset for the Gh5 line and while I know the Ursa OS can't proxy record I hope it can backup for redundancy? Would save the need for an external recorder on anything I'm getting paid to shoot, never want to be the guy/girl who lost the footage. Ryan Payne wrote: Not sure if it's been asked/ requested but will we be able to dual record/ relay record? SSD - Cfast for higher codecs and SSD- SD or Cfast to SD for lower?